Wondering what are the best areas for stay in Chennai? We hope this travel guide for Chennai helps you decided just that - areas to stay during your next visit to the capital of Tamil Nadu. You can decide to stay in a nice hotel close to the airport or one of the many centrally located railway stations in Chennai or near a business neighborhood that is centrally located and will help reducing your travel time from the hotel. Below are some of the important areas to learn about before you book a hotel for your next Chennai trip. Chennai Central Railway Station is a major railhead of the city hosting both long distance and local trains. It is located centrally in the city, just 2.5 km from Egmore Railway Station and 19 km from the airport. This railway station is within 5-8 kms of Mylapore, T Nagar and Anna Nagar - some of the most happening places in Chennai. Superb transportation including taxis, autos, buses and local trains, is available to visit any part of the city easily. Chennai Egmore Railway Station is another main railway terminal after Central railway station serving the city. It also handles long distant and local trains. Accommodation near Egmore Railway Station provides you an easy access over entire Egmore area, including the famous Egmore Museum and several other important places. This station is just 2 kms from Mount road, 4 kms from Anna Salai (US consulate is located here) and less than 7kms from Mylapore and T Nagar. Chennai or Anna International Airport is about 19 km south-west of the city center. It is connected with the Chennai Suburban railway network via Meenambakkam Station and is about 12 kms from T Nagar, and 18km from Egmore and Chennai Central railway stations. International and domestic terminals are just adjacent to each other. As the airport is accessible by both MTC bus service, taxi services and MRTS rail network, transportation to city center is easy. A stay near airport is recommended for air travelers wanting to quickly get in and out of the city and you can find some good accommodations nearby. Undoubtedly the most famous landmark of Chennai, Marina Beach is a natural stretch of some 13 km of sandy beach along the Bay of Bengal. It is a favorite hangout place for tourists as well as locals in evenings. The beach also has several memorials and statues, memorials of C. N. Annadurai and MGR being the main. Marina Beach is located 18 km from international airport, 4 km from central railway station and 5 km from Egmore railway station. Staying in one of the hotels near Marina Beach can provide you a lifetime memorable experience. Theagaraya Nagar or T Nagar is a neighborhood of Chennai and a renowned shopping hub in Chennai. Tirumala Tirupati Devasthanam, a replica of Tirupati Temple and Panagal Park, spread over an area of 8 acre is a key charm of T Nagar. Located some 8 km from Chennai Central railway station and 6 km from Egmore railway station, T Nagar is a preferred location for stay in Chennai - whether you are in for tourism or for business. You can find easy transportation by auto or Taxis from this area to any other parts of Chennai any time of the day. Famous as traders� joint, Mount Road is another important neighborhood of Chennai. It starts from Cooum Creek and ends at the Kathipara Junction. Also known as Anna Salai, this area consists some of the major landmarks in Chennai. Some major among them are US Consulate, Apollo Hospital, St. Thomas Mount, Anna Flyover and Higginbotham's, which is the oldest book shop in India. Apart from that, several IT companies, government offices, political party headquarters, religious places, theaters, clubs, cafes and restaurants are also there. Mount Road is some 12 km from Chennai International Airport, 6 km from Egmore Railway Station and 8 km from Central Railway Station. Mount Road or Anna Salai has one of the highest concentrations of hotels in Chennai - both in budget and luxury categories. Located in the southern part of the city, Mylapore is the cultural heart of Chennai. This area is known for housing some of the ancient and famous religious places. 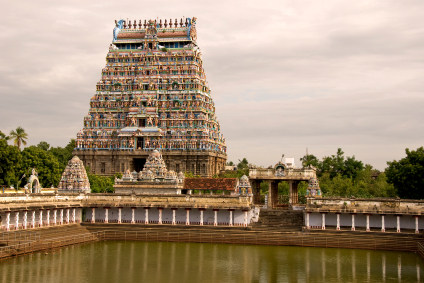 Some notable among them are Kapaleeshwarar Temple (built in 7th century), Thiruvalluvar Temple, Sri Ramakrishna Math & Universal Temple, San Thome Basilica and Sri Srinivasar Koil. Mylapore also consists of some fine shopping hubs and exhibition halls. If you want to closely observe the cultural heritage of Chennai, consider staying in this area. Chennai International Airport is 15 km, and Egmore and Central railway stations are 7 and 8 km from here respectively. Ashok Nagar is one of the major residential areas in Chennai and hence ideally houses many important establishments such as shopping hubs, educational institutes, restaurants, multiplexes and parks. Chennai International Airport (10 km) as well as Central and Egmore Railway Station (12 and 9 km respectively) are easily reachable due to fine bus as well as suburban rail service. One of the oldest (more than 150 years) areas of Chennai, Gandhi Nagar is situated on the banks of Adyar River in the southern part of the city. It is counted among the major commercial hubs of Chennai and is home to several good hotels, restaurants and shopping destinations. It is 10 km from Egmore railway station, 12 km from Central railway station and 13 km from Chennai International Airport. By staying in Gandhinagar, you can also have an easy access to the neighborhood areas such as Katuribai Nagar and Indira Nagar. Being connected with bus as well as suburban rail network, transportation is also quite convenient. It is also known as Chennai Museum and is a prime identity of this beautiful city. Located on the Panthon Road, it is quite comfortably accessible from Egmore railway station (2 km) and Central Railway Station (4 km). A renowned institution for ophthalmic care, Shankara Nethralaya is one of the key identities of Chennai. If you plan on visiting this hospital often, one can stay in one of the may hotels near this institution situated on Collage Road or in a hotel near Egmore just 2.5 kms away, near Egmore Railway Station 3 km away or near Central Railway Station which is 5 kms away.